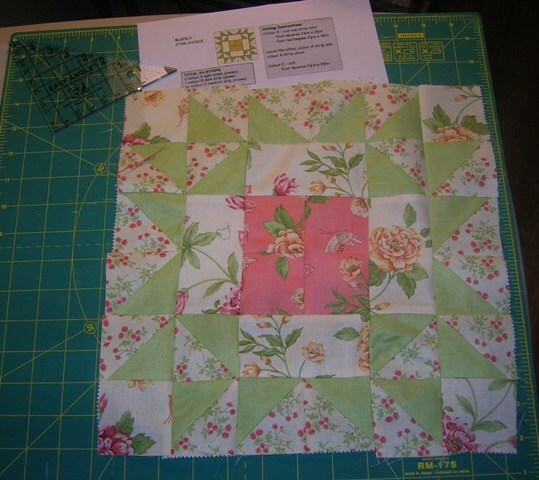 When I got home and checked my fav blogs, I found that the ladies from the Quilt Room have already uploaded the next block for their mystery. It is called Star Choice. (Now I should be doing things around the house but instead I got to work on the block). I really like this one. I need to make about 10 miles of binding for Patches and Pinwheels. In the word os Scarlett..."I'll think about it tomorrow!" Moda Man went to visit Brenda last evening and brought his pet with him. After some discussion, Pat, Becky and Brenda thought his name should be Bolt. I also liked "Bobbin". But he looks like a "Bolt" don't you think? Thanks to Brenda for a lovely evening. Ms. Thimble was KNITTING! No more coffin quilts...onto knitted coffin cloths? The block was posted early this morning but I had to wait until I finished work to make it up. Work does get in the way of my play time! Pat-the Grand Thimble renamed this quilt "cheetos". Cheetos is one of her favorite snacks and she has developed a way of eating them while sewing. I think Cindi has a picture of her technique. Time to post, Cindi! Anyway, after losing pieces and then replacing a couple of pieces, I have finished this top. 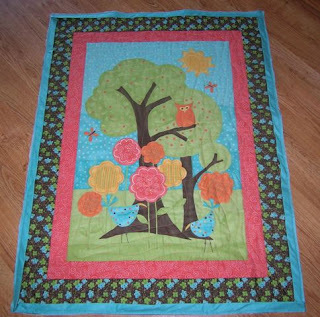 I will have to have this quilt adopted out since it matches nothing in my house. I think it will fit in in Laurie's decor. I also finished this little quilt for Punky Loo. It has an owl on it so I just had to make it for her. 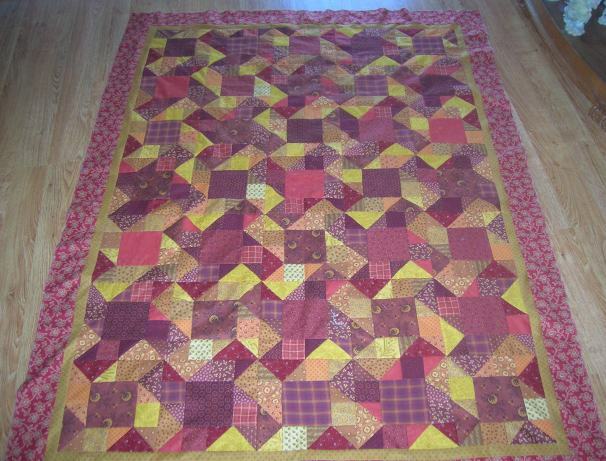 I quilted it yesterday and all it need now is to have the binding sewed on. Handwork for Tuesday...yipee! I worked some on the garage yesterday. Still have more to do but the new door won't be installed until next week. Beautiful day today but I am tired since I didn't sleep well last night. And that is the fault of the weathermen who kept saying really bad weather was coming Fortunately it didn't happen. 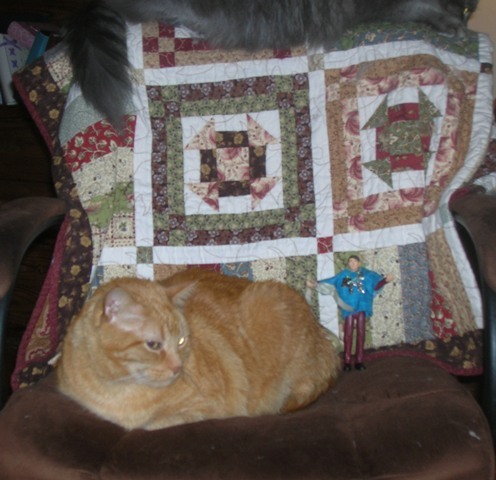 I resumed work on the Cheetos quilt at Thimbles this weekend. I had to make 144 flying geese units. Pretty much took me the weekend to do it. I finished them up using the wing Clipper. It is a good tool. If one needs to do a gaggle of geese, one should have one of these toys! 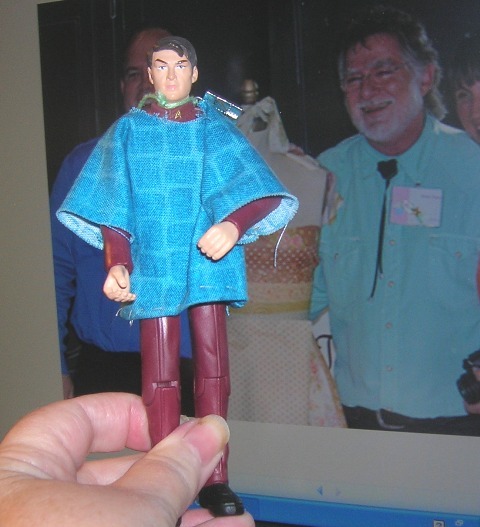 Pat emailed me a picture of the original Moda Man. As I said I am calling him the other Moda Man. 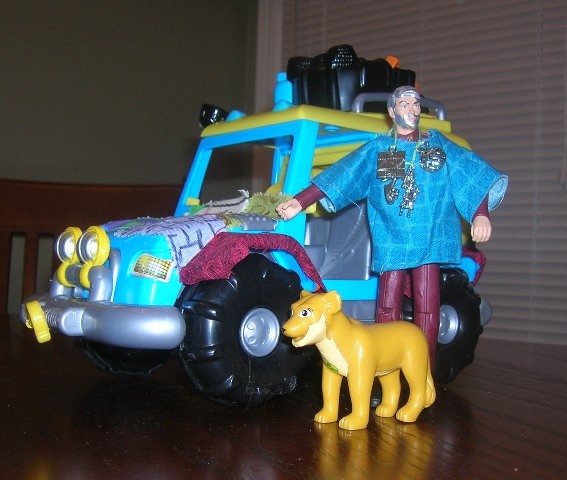 Yesterday I stopped at the J store because I had to get glue to detail the jeep. It is a work in progress. I will post a picture when I complete it. But I also got a pen to make Moda Man's hair look like the other one. And facial hair????? and glasses??? Garage door man coming this AM to do measurements. Yesterday I spent time with my wonderful friends at Thimbles. These women are such a creative and funny bunch. It is amazing how fast the time flies when we are together. Sometimes we don't accomplish a lot but we solve a lot of the world's problems. Of course, there is Pat, our fearless leader. We even let her believe she has some control over this group...haha. She says it is like herding cats..I think that would probably be easier. Moda Man likes to go and watch the goings on. Yesterday someone said that he needs a car. After all, he already has furniture. Kristie thought it should be a jag. At any rate, after Thimbles and an oil change for MY car, we went car shopping. 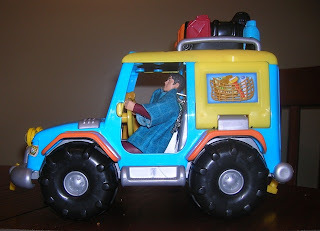 Mind you, now I am in Toys R Us with Moda Man holding him up to cars. We finally settled on the beauty above. He could not wait to show you. I am going to have it "detailed". Picture to follow when I figure out how to do it. He thought he needed a pet as well! His new wheels have great possibilities. Lots of room for stuff! Pat emailed me a picture today of the other Moda Man. She called him the real Moda Man but I will be calling him the other Moda Man! We had a discussion about them this evening. I now have to get a pigma pen to change his hair color and find some teeny tiny glasses! Then Pat said she thinks he needs a car..not just any car but one that is patterned! And who says that I am the only one off a little bit? I wanted to visit the Friday night Thimbles so I could see some of the people I miss on Saturday. Also needed to see if Pat located the pieces of last month's project that I dropped in the parking lot. Fortunately she did. i came home and am trying to figure out how this thing goes together. Maybe tomorrow it will make more sense! 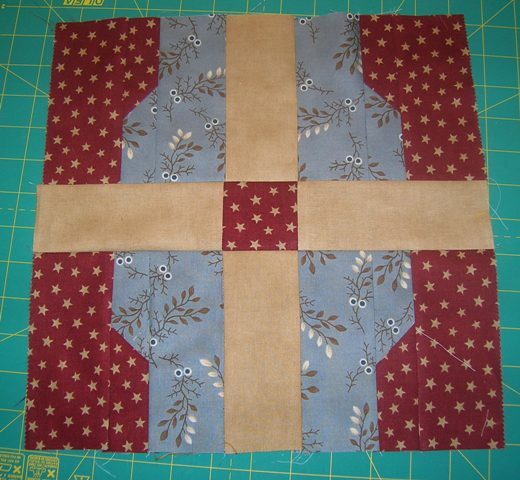 I had to wait until I picked up my sewing machine this afternoon to make this block. It had not had a tune up in a looooonggggg time. (And Mr. Nixon told me so!) And now it is just humming...it is a good machine. When I got back here, I whipped up this block. 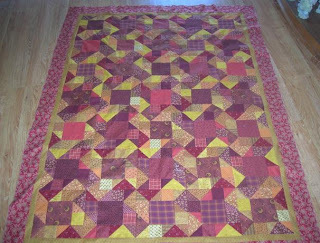 I think there are 12 blocks altogether in this quilt. 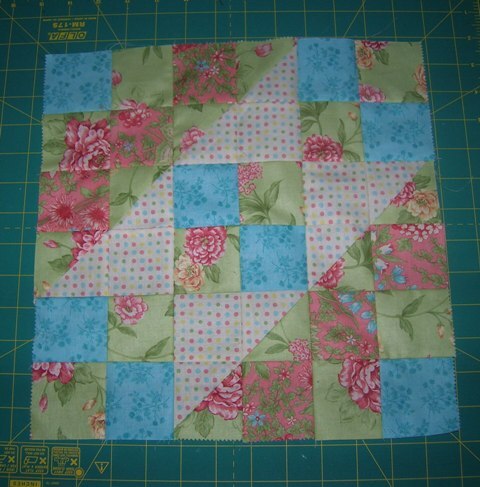 Okay...sewing buds...how many blocks? 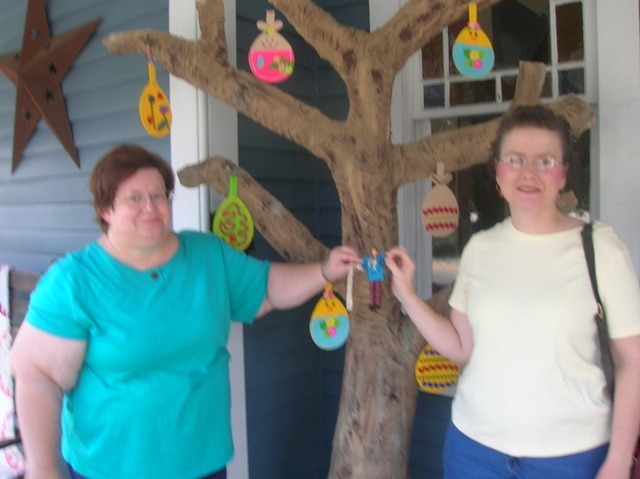 There are several of us doing this project, thanks to Ms. Gretchen! 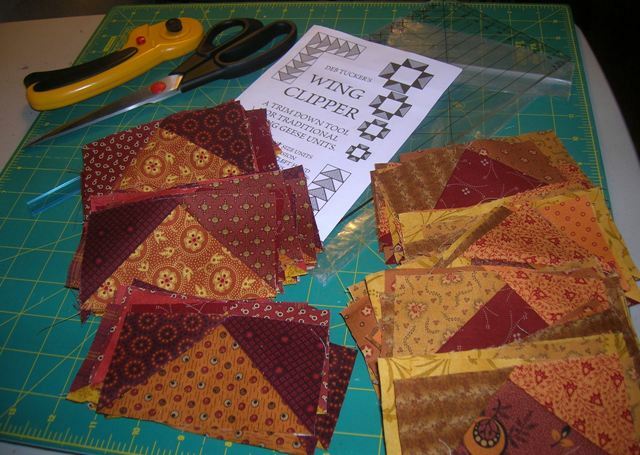 And speaking of said quiltress extraordinaire...did you see the post on the Quilt Room with their new book? I will HAVE TO HAVE this book when it is published! I just wanted to make sure that you know that I can handle myself with the other denizens of the household. Henry is really quite nice and Wild Willie is just a kid. Mostly they don't bother me. I am anxious to see you again. I will jump into her quilting supplies when she heads out for Thimbles. She came home today with some fabbies from one of my lines. Although she didn't buy very much. What's with that? 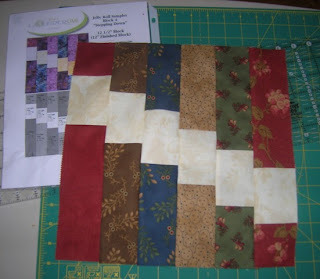 This is the second block of the jelly roll sampler quilt. 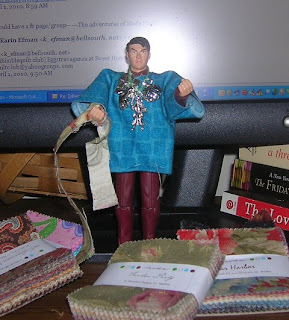 It is about all the sewing I am able to concentrate on at the present time. No attention span whatsoever!! Didn't sleep well last night probably because I was thinking last evening how well I had been over the past couple of weeks. Or it could be related to the air quality. I am so hoping for some rain to knock down the pollen a bit. 5973 is ridiculous! I swear the air is yellow. Looking to break the record? Springtime in the ATL means pollen. Today's pollen count is 2967. The record was 3583 achieved (?) on 4/6/09. 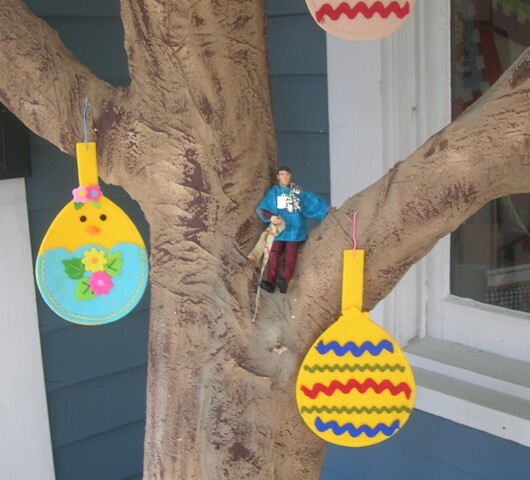 Moda Man went out to Sweet Home to check out the Easter egg tree. He really thought it was great. He is now quite familiar with the store and they know him by name! He wanted to have a photo op with his friends Cindi and Sarah. We all did a little shopping. He checked in with Pat-the Grand Thimble while he was there as well. 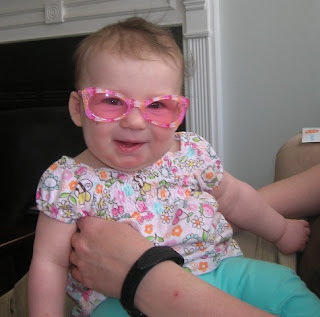 Had to make a stop to give Alice her new shades. Now she can see the world through rose colored glasses. She was in a really good mood while I was there. Gotta luv that little girl! Moda Man seems to be cultivating new friends. It is nice to know that I am not alone out there as a wackadoo. We are planning on a little Easter weekend trip to Bad Melisa's. He wants to see what she has done with the apple tree. 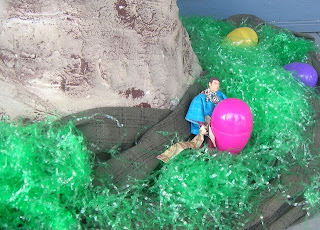 It is now an Easter egg tree. And my children think that I am nut? However, when they were young, I decorated a real tree in the front yard with plastic eggs. It was obvious then, they just didn't know it! Maybe Moda Man should have a most excellent adventure?